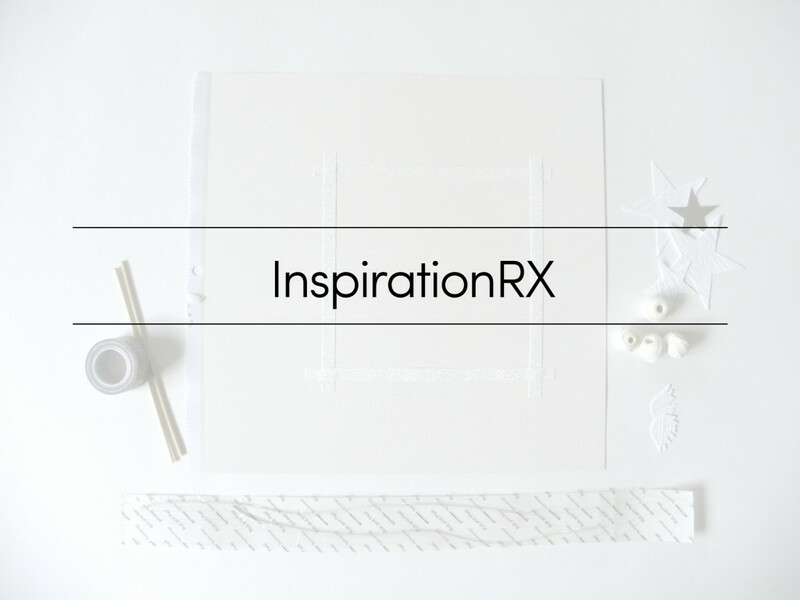 I’m participating in a creative exercise called “InspirationRX” via Besotted Brand blog. Each week we are given a prompt word and those participating come up with a creative expression such as an illustration, photo or craft. The important thing is that it has to be your own work! This week’s prompt was the word “Listen”. What happens when you stop and close your eyes and listen? What do you hear? What thoughts, ideas come to mind? I first did this little exercise at my local Whole Foods. I was there by myself, having lunch and enjoying a delicious bowl of carrot Thai food. Usually I would dig my phone out and read the news or look at Pinterest while I’m eating. Instead this time I savored my soup, closed my eyes and just listened. It was midday and Whole Foods is far from quiet! I kept hearing the “din din din” sounds of the check out register. Foot steps everywhere and all the bustling and rushing all at once. I decided to go to my car and get back on the road to pick up my sons from school. This time, I stayed in the car in front of the school and just listened. It was very quiet, there were faint laughs of students walking to the bathroom, a dog barking at a distance and the wind. I started thinking how my days are going to get even busier and busier with the holidays happening soon. October is just fading away too fast. Fast forward to Sunday, I’m in a quiet house (the boys went fishing with Paul) and my little girl is still under the weather napping on the couch. I sat by my crafting table enjoying every single minute of solitude. I decided to put together a vignette of a peaceful scene during the winter. I worked with a very subtle palette, whites, creams and silver. Please take a look below. This vignette represents a quiet Christmas Eve at home. I will hang this craft by the door to remind me to be still, quiet and listen. With three little kids this can be close to impossible, but if I pursue a little bit of quietness during the day or evening, I will feel more peaceful and not get carried away by all the noise, to-do lists and the never-ending Christmas shopping. I want to remain still and peaceful. There is a verse from the book of Psalms that expresses exactly what I long to feel this Christmas season. Peace and contentment celebrating the birth of my Saviour. What a beautiful post! I got relaxed just reading (and looking at that great winter scene)! I’m in love with this. I can almost “hear” the quiet. Very beautiful. So peaceful. What a beautiful post and project. I just “listened” and heard the reassuring sounds of a morning at home. The quiet thump of the refridgerator door closing, the sound of the toaster popping up, and the tinkle of juice being stirred as my daughter prepares her breakfast. I am going to try this exercise every day this month! Thank you for sharing it at What We Accomplished Wednesdays. 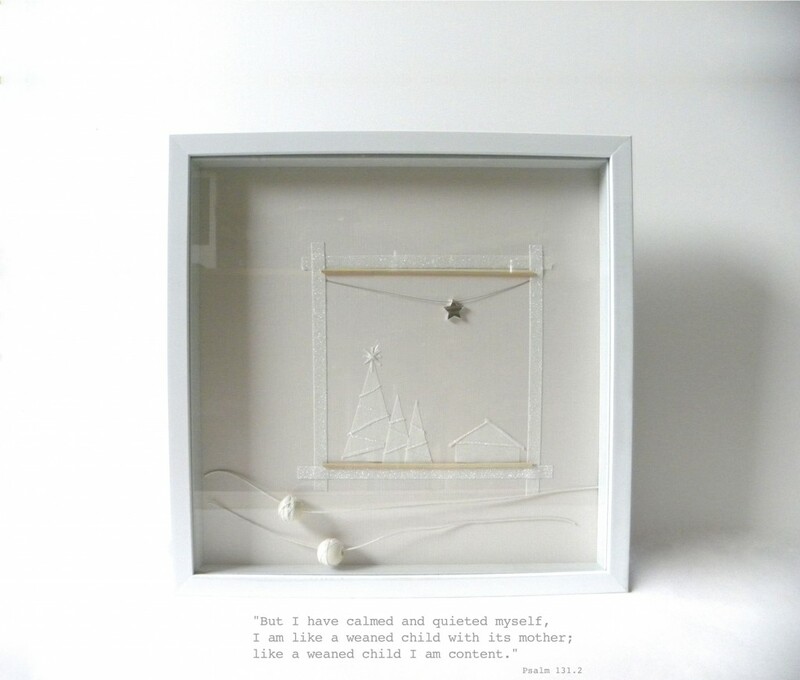 Your shadow box picture is so beautiful and serene. I love it. What did you use for lines on the trees as garland? Did you use white vellum paper? Your picture is like it’s telling us to hush and be still, enjoy the moment, just be. Ah how well I know the crazy of living with 3 small children. I had 3 kiddos in 4 yrs. sure glad I was quite young then. Having quiet was something I don’t think I really “needed” til I got older. Now I can sit in here without the tv on most of the time. When I go somewhere alone in the car I don’t have radio on. Many times I’ll leave the tv off most of the day when I’m busy crafting, creating. You are so smart to find your quiet. It’s something we all need at some point in our lives. We just have to be ready for it. It wasn’t until we moved from San Diego area to 20 acres in country on a lake in MT that I learned to enjoy and appreciate, let alone need the quiet. I would get up in morning, go outside and just listen to the birds, whatever was going on. We could hear cars coming from miles away and were 1 1/2 miles off the highway on a private road. After San Diego believe me it was quite an experience. I was 52 then and must have been ready for the quiet, such a different life. The space around, the lake, mountains, animals were just what I needed. My hubs was a truck driver so was gone alot. I had to learn to be alone. When we moved out there, there were only 4 of us spread out all over. It took me awhile to get to meet our neighbors. Our grown up kids were all off on their own in San Diego. Enjoy your holiday season, having 3 young ones makes it so much fun as well as all the work. Before we know it the holidays will be gone and we’ll all be back at “real life” again. Wishing you and your family the happiest and healthiest Christmas ever. Hello JaneEllen! Thank you for visiting my blog! I’m so happy you enjoyed my post and wanted to give you the details of the materials I used on the shadow box. First the trees are made out of “onion” paper, I don’t know if this is the official name but I purchased it Ben Franklins. The “garland” is made out of white glitter tape. I cut the tape into very thin strips and then tape it to the trees. The other materials are silver wire for jewelry making and white leather cord. I hope you follow my blog too :) Cheers and Happy Holiday to you too! What a beautiful idea, thanks for the details above of how you made it. It’s so nice to have a reminder to stop and breathe amongst all the holiday madness.